Stocks: Will markets stay above 14,000? 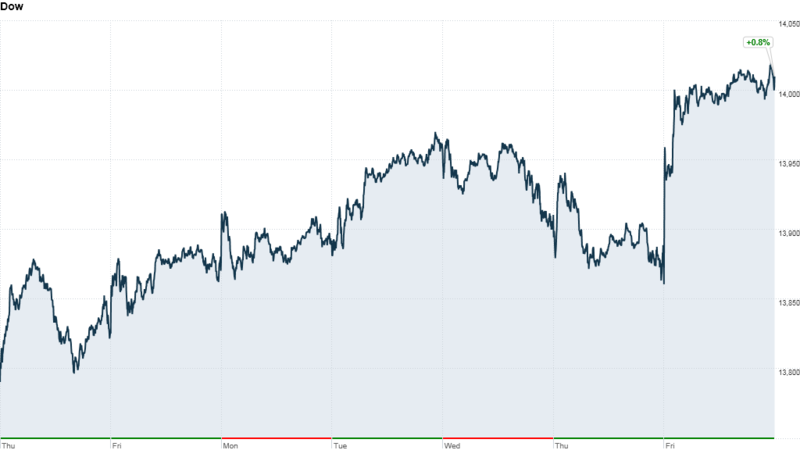 Stocks: Will Dow stay above 14,000? Investors might be hoping to hang on to the momentum after the Dow topped 14,000 for the first time in over five years. But in the coming week, only a handful of economic reports and corporate earnings will trickle through to guide them. U.S. manufacturing will be in focus, with factory orders, productivity, unit labor costs, ISM services and wholesale inventories on tap. Overall, economists surveyed by Briefing.com are expecting disappointing numbers. The sector has stalled over the last year, vacillating between barely expanding and contracting. That's because demand has pulled back in recent months on slow economic growth overseas and worries over the federal budget mess in Washington. The slowdown hurt manufacturing jobs, the latest report from the Bureau of Labor Statistics showed. After generating nearly a quarter million jobs since the recession ended, the industry has seen zero job growth since the middle of last year. Worldwide manufacturing has also shown a mixed picture in recent months. Activity in China, which is considered a barometer for global growth since it is the world's biggest exporter, revealed positive signs of a pick up last month, but reports hinted at continued weakness in export markets. Investors will also get more data on how Americans are faring with their finances this week, with a consumer credit report out on Thursday. In corporate news, several key tech companies will report earnings this week, including Sony (SNE), Sprint Nextel (S) and AOL (AOL). Yum! Brands (YUM), Time Warner (TWC)and News Corp (NWS) are also on tap. Despite the Dow's big gains on Friday, stocks ended last week only modestly higher. The Dow gained 0.8%, the S&P 500 increased 0.6% and the Nasdaq climbed 0.9%.